Plans for the 50th anniversary of the Beatles conquering the US and the world are starting to gather pace. The big news though is that Capitol Records and Apple Corps have just officially announced the release of The U.S. Albums, a new 13 CD Beatles collection spanning from 1964’s Meet The Beatles! to 1970’s Hey Jude. Great to see The Beatles’ Story included in there. And if you check the photo above (and promo video below) you can see that Yesterday and Today comes with what looks like a peel-off Butcher Cover! 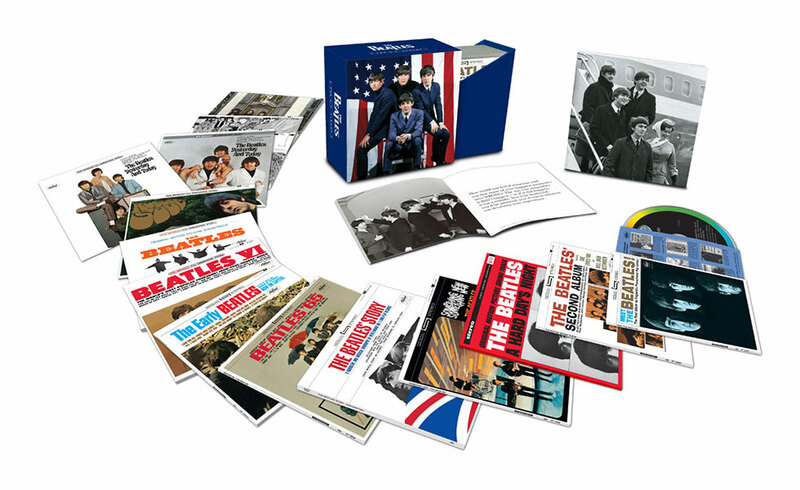 To commemorate the 50th anniversary of these history-making events, The U.S. Albums, a new 13CD Beatles collection spanning 1964’s Meet The Beatles! to 1970’s Hey Jude, will be released January 17 by Apple Corps Ltd./Capitol. The Beatles’ U.S. albums differed from the band’s U.K. albums in a variety of ways, including different track lists, song mixes, album titles, and art. By the end of 1963, before The Beatles’ American arrival, “Beatlemania” had already sprung forth across the Atlantic to take root in the U.S. In early December, The New York Times published a Sunday magazine feature and “CBS Evening News” aired an in-depth report about the unprecedented frenzy over the young band from Liverpool. Radio stations across the U.S. began to play The Beatles’ latest U.K. singles in almost non-stop rotation, trying to meet an insatiable listener demand. Capitol Records rushed out the American single for “I Want To Hold Your Hand” (with B-side “This Boy”) on December 26, three weeks ahead of schedule and one month after the single’s U.K. release. More than one million copies of the U.S. single were sold within 10 days. On January 3, 1964 Capitol released “Please Please Me” (with B-side “From Me To You”), and The Beatles’ first Capitol album, Meet The Beatles!, followed on January 20. After achieving the No. 1 chart position for five consecutive weeks in the U.K., “I Want To Hold Your Hand” reached the top of the U.S. singles chart on February 1, holding the No. 1 position for seven consecutive weeks, and within two months, more than 3.5 million copies of Meet The Beatles! were sold in the U.S.
After captivating North America with their Ed Sullivan debut, The Beatles traveled to Washington, DC, performing their first Stateside concert on February 11 at the Washington Coliseum to 8,000 fans in the round. The Beatles then returned to New York for two sold-out Carnegie Hall concerts on February 12. On February 16, they made their second appearance on “The Ed Sullivan Show” in a live broadcast from The Deauville Hotel in Miami Beach, Florida. Viewership for the episode was nearly as strong as for their debut one week prior, with an estimated 70 million people — 40% of the American population — tuned in to watch their performances of six songs. On February 22, The Beatles returned to England in triumph, welcomed home upon their 7am landing at London’s Heathrow Airport by an estimated 10,000 fans. For more visit the Beatles Official site, and the Beatles Official Shop. This entry was posted in Beatles, Beatles Music, Capitol Records and tagged 50th anniversary, Apple Records, Beatles, Beatles Box Sets, Capitol Records by beatlesblogger. Bookmark the permalink.